Posted by Shawn Kriewaldt. on Tuesday, December 13th, 2016 at 12:19pm. There are a few major misconceptions that home sellers have about the winter market. 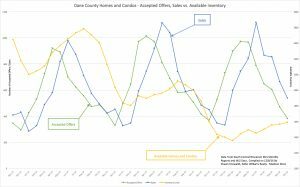 If you watched my video above, you'll see that accepted offers in 2015 for single-family homes and condos in Dane County were at their peak in March, April, and May. December shows the fewest number of accepted offers. 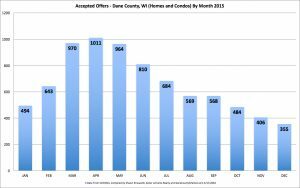 Take a look at the number of accepted offers and closings in the chart below. Closing occurs right around 50 days after the offer is accepted. Judging just by these charts featured in my video, you'd probably point to March as the best time to list your house. The number of buyers, listings, and accepted offers starts to peak at this time. Winter buyers are more serious. Let's take a deeper look, though. Although the number of sales in December is much lower than it is during the earlier months, you'd have a lot less competition by selling in the winter. But who in their right mind wants to purchase a house at this time, you ask? Daylight savings time is over, the weather is colder, and it's dark by the time most people get off of work. So who are these buyers? Serious buyers, that's who. Having your house on the market in the winter months will mean fewer showings, but it will also mean far more serious buyers. Additionally, consider that many houses listed in the summer will expire around this time and they won't be re-listed until the spring or early next summer. This is good news for you as a seller. And finally, remember that interest rates are still at historically low levels. This means more affordability for buyers, which in turn, means better chances to get your property sold. I hope this information is helpful to you regardless of your situation. If you're thinking of selling your home this winter, give me a call or email me. I'd be happy to help you out.